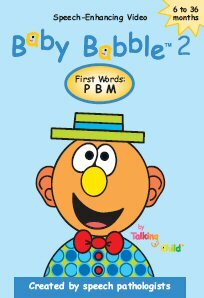 Baby Babble 2 - P, B & M. The Baby Babble award winning series engages babies, toddlers, and beginning talkers with fascinating toys and charming music while introducing age-appropriate speech and language concepts, facial exercises, and sign language. Created by speech language pathologists, Baby Babble™ 2 focuses on the early developing sounds: P, B & M.
Why P, B & M? At around six months of age, babies begin to make sounds with their mouths partially closed. These sounds are called consonants and the first consonants that most babies say are /p/, /b/, and /m/. Baby Babble™ 2 introduces over 100 first words with these early developing sounds. Babies love Baby Babble™ 2 because facial exercises captivate them, encourage mimicking, and enhance their oral motor development. 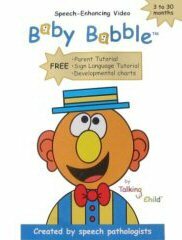 Toddlers love Baby Babble™ 2 because simple sign language inspires them and teaches them how to communicate before they can speak. Beginning talkers love Baby Babble™ 2 because playful video sequences demonstrate simple words and sounds that motivate speech. Parents love Baby Babble™ 2 because its parent tutorial teaches them the techniques that speech therapists use so that they can enhance the speech development of their precious child. Bonus features include a parent tutorial and sign language tutorial.